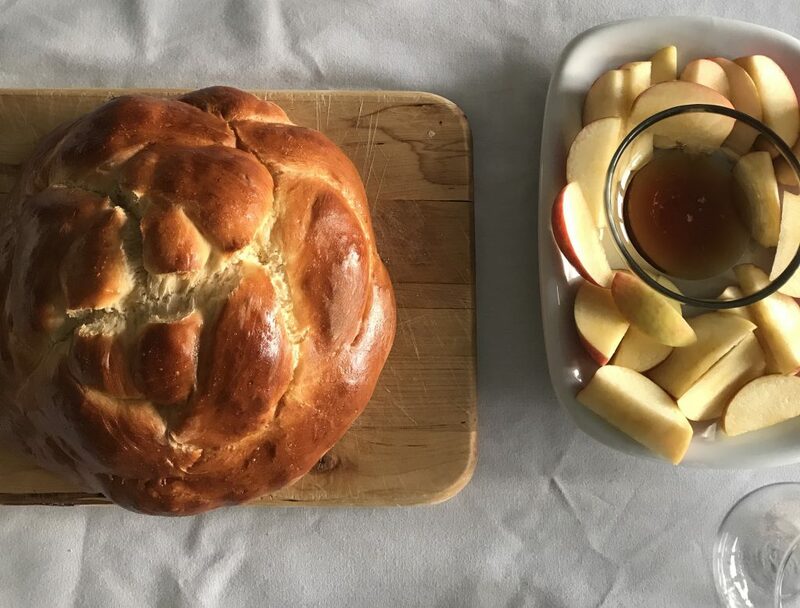 What we’re eating and reading this week: For starters: THIS CHALLAH (page 6, How to Celebrate Everything, it’s the half size). Every single time I bake one (usually for Rosh Hashana) I say to myself: I’m going to make a Friday ritual of this. Because seriously, what is the point of having a flexible schedule if I can’t make that happen? Dammmn, nothing beats a freshly baked challah. Except maybe a freshly baked challah studded with golden raisins. (Next Friday! Check instagram!) Shana tova to those of you celebrating the New Year. I’m reading this one right now. Eight genius pie crust hacks — I made the heart-hack last weekend. The National Book Awards Longlist for Young People’s Literature. It’s 10 pm. Do you know what apps your kids are using? This collection is so fascinating/stressful. Lastly, question for you: I just booked a trip to Montreal for the end of October. Where should we go? What should we eat? Montreal: Olive et Gourmand. Life-changing. ENJOY! We also LOVED Olive et Gourmando! Chocolats Favoris — the best chocolate dipped ice cream I have ever had. You must rent bikes in Montreal and bike around the city. And have their take on bagels. Such a great city! okay, you HAVE to have poutine while you’re in Montreal, or you’re missing out! When we were there in October in 2015, we went to Patati Patata, 4177 St Laurent Blvd, and it was WAY better than the other place that gets all the hype, La Banquise. It’s a hole.in.the.wall, but it’s fantastic! one tip: don’t go at dinner time or later. so so so yummy! the other place that’s great to visit is the St. Viateur Bagel shop in the Jewish area of Montreal: 263 Rue Saint Viateur O. They make bagels around the clock, and they are almost as good as the atmosphere on the streets! we rode bikes we rented from Bixi stations and had a great time getting around! don’t rent a car–the train is great great great at getting you where you need to go! I dont know what you should eat, but you should read Shadows on the Rock by Willa Cather! I have never been to Montreal, but I just wanted to say that I loved the article on Colin Kaepernick – I live in Germany and had only heard of him briefly. What an inspiring man! Thank you for the shoutout. Boris Bistro! I dream about the duck risotto and the chocolate marquise dessert! Eat on the terrace if it is nice (and only those over 18 are allowed inside the bistro – under 18 can eat on the terrace until 7:30 or 8pm – some complicated rules about serving alcohol and minors). We liked the poutine at Dunn’s Famous. Loved the Science Museum when daughter was 12.
montreal… you will never eat a better bagel! i promise! We(myself, husband and 8yr old son) go to Montreal once a year to eat. We do other things but it’s really about the food. When we say we are going to Montreal the list of suggestions of places to try from friends, can get overwhelming. There are so many fantastic places to eat. These are places we go to every time… without fail. It cannot be a trip to Montreal without them. After that, we chip away at the suggestion list! L’Express – Hands down our favourite. Classic bistro, seasonal and classic dishes, impeccable service, unpretentious. So many fantastic dinner memories here. Patisserie Au Kouign Amann – Pastry like no other, delicious coffee and fresh squeezed juice. Schwartz’s Deli – Get a plate of Montreal smoked meat, stack of rye, pickle and coleslaw. Wash it all down with a Cott Black Cherry soda. There is a great divide when it comes to which Montreal Smoked Meat is the best but I feel like everyone should start here. St-Viateur Bagel – Get a bag of classic sesame seed bagels and the fixings and go to Parc Mont Royal for a picnic. You might want to grab a coffee at Cafe Olimpico down the street, sit on a bench outside and people watch before you do. Olive et Gourmande – Perfect place for lunch in Old Montreal. Everything on this menu so creative, inspiring and yummy. We’ve recreated many of their dishes at home. Usually a line up but worth the wait. Believe it or not, the Polish restaurant Stash was our most memorable and delicious. It’s right there in Vieux Montreal on Rue St. Jacques. You’ll see in on all the “best of” lists too. Thank you so much for sharing the article on Colin Kaepernick. It gave me so much food for thought as well as a greater understanding of and appreciation for what he is hoping to accomplish and where his heart lies. Montreal is so awesome! Definitely St. Viateur bagels – so chewy & wood-fired smoky – so good, and Schwartz’s for a smoked meat sandwich (medium fat, with a pickle and a black cherry to drink.) Good croissants at La Croissanterie Figaro on Hutchison. L’Avenue on Mount Royal has a great brunch (and the coolest bathrooms in town.) Yes also to Garde Manger, Olive et Gourmand, and L’Express. Plus: Toque for a splurge, Lemeac, Moleskine, Larry’s, Bouillon Bilk, Holder. For drinks try Bily Kun on Mount Royal, Dieu du Ciel on Laurier for craft beers & ciders, Le Cheval Blanc on Ontario St., or Les Soeurs Grises on rue McGill. oh yes, and Mandy’s Salads! There are a few locations including Sherbrooke St. in Westmount, Crescent St, and Laurier. Aux Vivres on St Laurent. It’s vegan, but you don’t have to be to find this food amazing. Dragon sauce is life changing. My nine yo devoured a coconut BLT. We go through Montreal yearly and stop here every chance we get. You MUST eat at Au Pied De Cochon and you MUST order the Foie Gras Poutine!!! I second Garde Manger-we go every time we’re in town! Also, the lantern festival at the botanical gardens is stunning. Noodle soup at Nouilles de lan Zhou-the best noodle soup I’ve ever eaten. Oh, I am starting my plan “one book per week” and 7 Steps to a Clutter Free Kitchen is what I need now! I never travel Montreal before, hope you will have a good trip and don’t forget post new articles! Thank you for the book listings! I appreciate them as much as your delicious recipes and fun ideas. I am usually a reader and not a commenter but I had to weigh in on my beloved Montreal! Agree with others’ recommendations of L’Express, Bouillon Bilk, and Garde Manger, but you won’t go wrong with any of the suggestions! Can’t wait to read about your visit. My family went to Montreal a few Octobers ago and stayed in an Airbnb in Little Italy near the Jean Talon food market. The market was so wonderful that we went there more than once a day on many days! We were just in Montreal last month. Make sure to find Mandy’s. The most amazing salads!!!! They have several locations. Also, Hudson Bay for the iconic striped blankets, etc. Montreal is my town! I recommend Warehouse, a restaurant in the Mcgill ghetto where everything is 5$: burgers, pasta, salads, onion rings, donuts, etc. The food is amazing especially the donuts and the onion rings! Otherwise you have to hit MuvBox for lobster rolls, September Surf for coffee and Hoche Glacé for ice cream!